… to Moata for winning a Qantas Media Award for her Blog Idle. Totally deserved, she shows those celeb bloggers how it’s done – with a styling vocabulary and turn of phrase, plus sharp and smart observations. … and to Moata and the rest of the team from Christchurch City Libraries at the Auckland Readers and Writers Festival for bringing it on back home to those of us who can’t be there in person. 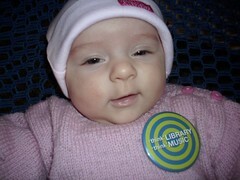 And to the library for supporting NZ Music Month and music in general.